This example program shows how to program the V5 Clawbot to move forward and backward using Modkit. First, the when (STARTED) block tells the robot to run this code when the program starts. A number variable, howMany is declared and assigned to 1. Then, the left motor is set to start rotating. Since startRotateFor is used, the motor will begin rotating and the program will continue immediately. Next, the right motor is set to rotate as well. Since rotateFor is used, the program will not continue until the motor completes its rotation. 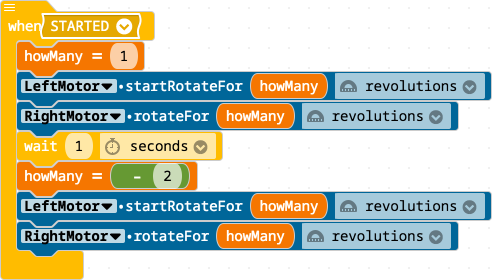 Finally, the howMany variable is set to -2, and the motor rotation blocks are repeated. Since a negative number is given to the motors, they will spin in the opposite direction this time.